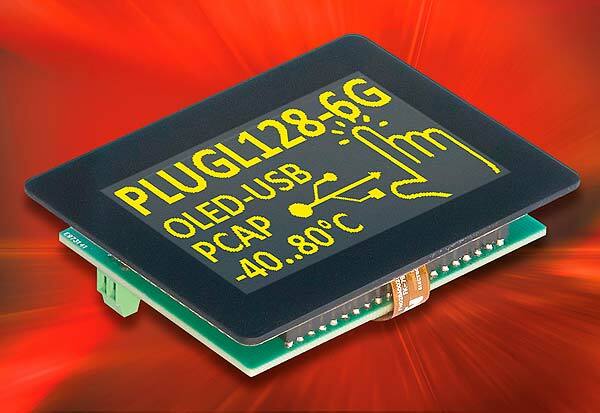 For the first time, ELECTRONIC ASSEMBLY presents the EA PLUGL128, a touch-sensitive OLED display that can be addressed directly via USB. It offers a resolution of 128 × 64 pixels with a 2.9″ screen diagonal. Since OLED technology enables each pixel to act as an independent light source, there is no angle-dependent contrast attenuation as is the case with LCD displays. The contrast of at least 2,000:1 remains constant over the entire viewing angle range of 170°. The display is extremely fast and still reacts smoothly and without delay even at temperatures as low as -40°C. The display is also extremely easy to read. It is protected by a robust, touch-sensitive glass pane. A gentle touch is all it takes to change displays or trigger actions. EA PLUGL128 is the first member of the new display family EA PLUGxxx. Displays with 1.6″ and 2.2″ screen diagonals will soon also be available. Visit ELECTRONIC ASSEMBLY at embedded world 2019: Hall 1, Booth 1-389.